Click Here or the image to find the plan! Sitting in the garden on a bright and sunny day is the most relaxing experience. That is unless you don’t have a trusty bench to sit on. 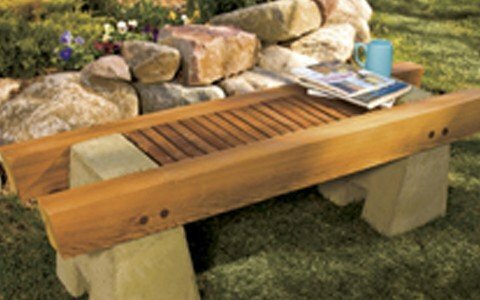 Handymanclub.com has provided a very zen concrete and wood bench design that will surely bring more life and energy into your garden. This bench consists of planks of cedar combined with blocks of concrete to create the design. This project is a fairly complicated one that consists of casting concrete into a very precise form. This part has to be done with extreme preciseness, or else the entire bench will become unstable or wobbly, not very zen if you ask me. Although this is definitely a pretty challenging undertaking, the very informative pdf that is provided on their website walks you through each step of the building process. This includes an exploded model image of the completed bench that reveals the inner workings of the bench so as to alleviate any confusion. Major plus to this particular design of bench is that it is extremely sturdy. It is very compact and held together very tight. The concrete makes the bench very heavy making sure that it won’t sway when sat on. This project will surely be worth the effort and your garden will definitely thank you and the makers of the plan. Get crafting!